There are no constants from person to person with regard to hand measurements. No two hands are alike, even your own. Personal fit preference varies as well. At DokiWear we have tried to take all these unique factors into account and provide you with a guide to get you in the right size range. Loosely wrap a tape measure around your palm at the widest point as shown. Round to the nearest 1 inch and refer to the size chart to find your suggested glove size. Use a string and mark it if you do not have a flexible measurement tape. Our sports compression glove fabric allows for good size coverage but on occasion, optimal fit could still be one size up or down from the size chart suggestion. If you want personalized consultation about fit please contact us at [contact@dokiwear.com] prior to ordering and we’d be happy to help you make your choice. Q: What if I am smack-dab between two sizes, what do I do then - go smaller or bigger? If you are right at the edge and in-between two sizes, we recommend sizing down rather than up for a nice comfortable fit. Going up would often provide a looser fit. Q: What if I am an exceptional case and have long skinny fingers, is there a finger sizing chart? No, we currently do not have a finger sizing chart, because the finger length is proportionate to how the hand is sized along the palm. This also holds true for any wrist sizing chart availability as well. have a difficult time fitting a DokiGlove. As always, if you have further questions (or any feedback on how to message this information) please email us at contact@dokiwear.com and we will always put effort into a response within 24hrs. Once you've worn the glove a few times it will conform to your hand for a perfect fit. Starting at the wrist and rolling it back over itself (turning it inside out). 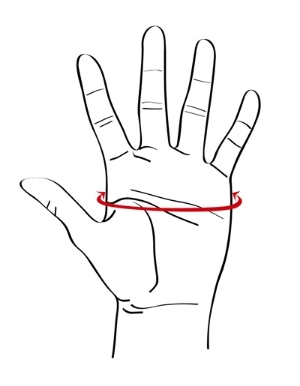 It’s easy and avoids the need to tug on each finger end. Turn the glove back right side out and give it a few shakes. Most of the fingers usually pop out but some may still need correcting. As with all athletic wear, keep the glove away from any sharp (needle-like) objects that can snag the Lycra fabric. It is also important to keep glove away from Velcro.